There’s no denying that fall has arrived. The afternoons may still get warm but the mornings are so nippy that I need to pull on a fleece before I walk the dogs. Soon our local fruit choices will shrink to little more than apples and pears. Right now, though, there’s a great selection of plums in the markets as some of the last gifts of summer. I’ve been stocking up on the sweet little Italian prune plums. They look for all the world like purple eggs that were dropped by mistake among the produce. The amber flesh turns an appetizing fuchsia pink when cooked. 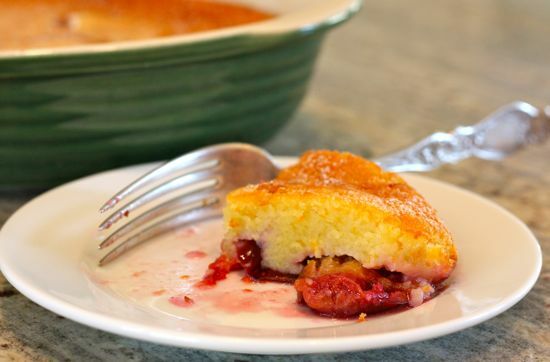 With their dense flesh and rich flavor, they’re just the ticket for clafoutis (klaw-foo-tee), a homey French dessert from the Limousin region traditionally made with cherries. As a nice bonus, removing the freestone pits from these plums is a snap. This is a quick but elegant dish that’s sort of a cross between a custard and a cake. The batter is an indulgent blend of cream, butter and eggs with just enough flour to hold it all together. Whip it up in minutes before dinner, pop it into the oven as you’re setting the table, and you’ll be eating it for dessert about 45 minutes later. My clafoutis began as a family recipe that Jessica Portner, a former colleague at the Mercury News, shared with me years ago. 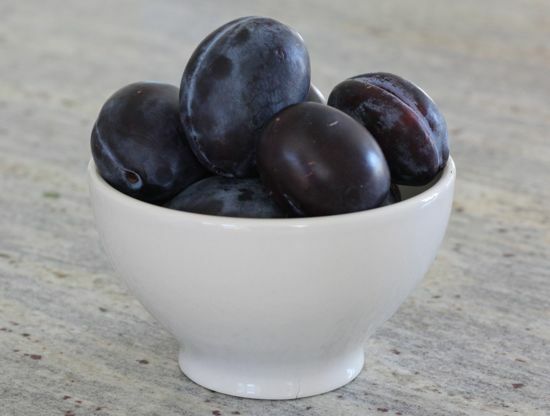 I’ve fiddled with it over time, reducing the flour a little to emphasize the custard qualities and, for these plums, adding orange zest to highlight the fruit flavors. It works well for many types of fruit–I’ve even made it with rhubarb, which really is a vegetable. Although it’s best served warm, my family often eats the leftovers for breakfast straight out of the refrigerator. Easy, versatile, delicious. What more can you ask from dessert? Powdered sugar for dustingPreheat oven to 400 degrees. In a food processor, whirl together sugar, eggs, cream, melted butter, vanilla and orange zest. Add flour and process until smooth. Butter a deep dish pie pan. Lay plums, cut side up, in a single layer in the bottom of the pan and cover with batter. Bake for 25-30 minutes, until top is deeply browned and the sides are set but the middle remains slightly soft. Cool for at least 10 minutes, then dust with powdered sugar before serving. Num! Love the sound of this. Sounds as if it would translate to GF easily. I LOVE clafoutis. Mostly cause I think I love saying it! Yum, thanks Aleta. Recipe says: 1/2 cup tablespoons sugar.. my guess is you mean 1/2 cup? Clafoutis is delicious, but try leaving the pits in the plums (or cherries). The pits change the flavor for the better.